The story of Jonah is a reminder that the God we worship is a God of all nations and God of all. My front window faces out to a green space where neighborhood kids play and pet owners walk their dogs. Most mornings you will find me sitting in front of that window, dogs in my lap, with a cup of coffee. It is my absolute comfort zone. I am at peace with myself and with the world. But at some point, the alarm goes off and it is time to start my day. The second I walk out the door, I am in the world. I am faced with a combination of people I like, people I tolerate and occasionally people who make me very uncomfortable. Actually, uncomfortable is probably not the word for it. Enemy is a bit strong, but more accurate. God asks Jonah to go to the last place on earth he would ever want to go, to Nineveh, home of his worst enemies. The closest comparison I can think of would be if God dropped me in the Middle East and asked me to preach the Gospel to an ISIS camp. That's Jonah’s task. Go to your country’s worst enemy, the people who will one day take half of your land and erase 10 of the 12 tribes of Israel off the map. Go see those folks and let them know I love them and would like them to clean up their act. Ummm…yeah, about that…I would really rather not. That is Jonah’s response. God said go right and he went as far left as he could go. But God was rather insistent on this point, so he arranges an “alternate form of transportation.” The ride ends up being so unpleasant that Jonah relents. And he preaches to the people of Nineveh. 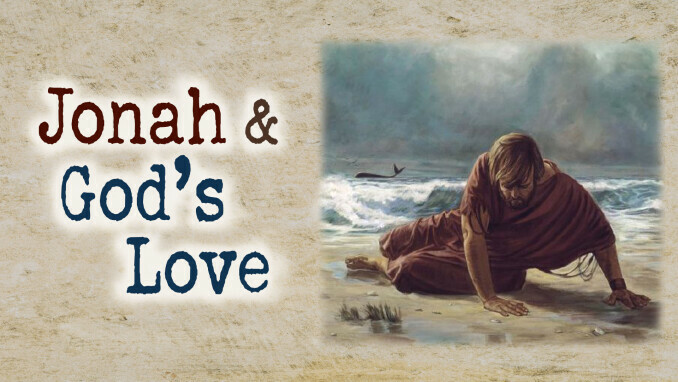 In spite of Jonah’s best effort to thwart the process; the people of Nineveh repent and turn to God. Jonah is less than pleased with his results. He is ticked off that his enemies are now in right standing with God. Why would God do this? Where is the fire and brimstone? This story stands in stark contrast to our stereotype of the God of the Old Testament. God loves not only His chosen people, but He loves the seemingly unlovable folks too. Jonah is forced to do what God has always had in mind for Israel. God blesses Israel not to show favoritism, but so that the people of Israel could bless the whole world. Which brings me back to my front window drinking coffee. I am blessed beyond measure. Yes, I have good days and bad days, and sometimes really awful days. But I am blessed by God. And I am not that sure that He is all that concerned with my comfort. I am blessed, I am loved and have relationships that are great now and will be forever. But there is a choice that I must make. Do I just selfishly soak up God’s blessings or do I share them with the world? Christians are blessed to be a blessing, not just to other Christians, not just our friends, but the whole of creation. That is a tall order. It goes way, way beyond any comfort zones. The book of Jonah leaves me with an uncomfortable question: Are there people in this world that, like Jonah, I would rather God exclude from, “the club?” I think I still have some work to do. God open my eyes. Tune my ears. Break my heart. Help me to see the world as You see it. Make Your love the center of my being. And help me to show Your love to others. Written by Ben Roberts. Ben leads one of the Men's Ministry groups. He lives in Ashburn with his wife Jennifer and their son Ethan.